Year 7 and I have decided to try ClassDojo this year. 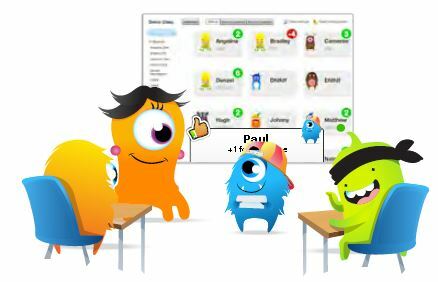 ClassDojo is a classroom tool that helps teachers record student behavior quickly and easily. Feedback points for specific behaviors can be awarded. (This is completely free). The class were very keen and this is our class decision not mine. The beauty of ClassDojo is the ease with which you can customise it. We discussed all the various categories we could have for points and have some great suggestions, points for marking and correcting work clearly for example and for asking great questions. We can also link this with our engagement with learning criteria used in school. We discussed the negative behaviours and decided that we should have anything which stops them learning either in or out of class, ‘off task’, or ‘no homework’ for example. We have far more positive behaviours than negative. Students can log in and see their own records and I do like the fact that they have a chance to reflect and add a comment themselves. Part of their homework this week is to think about the points system we will use, in fact whilst writing this post two students left comments on our homework blog with suggestions for points which I have duly added! I then used my phone to award the two of them a participation point! A computer can of course be used to award points but it is also possible to use a tablet or phone, apps are available for android and iPhone. I regard this as a good way to document their learning behaviours, it is absolutely not a traditional ‘reward’ system which I think can be a minefield! I want something accessible to all and is clear to us all that it is about each student being the best they can be. Writing that statement has made me realise we need points for being gritty (and the value of writing things down)! Select the image for the Desmos graph. As I always do I have been showing all my classes how helpful WolframAlpha is for checking working, so I was very pleased that when two of my Sixth Form students (UK age 16-18) came independently to see me about some homework they had both been using WolframAlpha to check answers. One student also asked about modulus inequalities and I showed her how simple it is to use the Desmos graphing calculator to illustrate the problem. The MathsTools site has a section for apps as well as many other categories. Personally I will be exploring all the android apps. iPad and iPhone categories are available also. Install GeoGebra on your android or apple tablet.. The National curriculum in England, Mathematics programmes of study for key stages 1, 2 and 3 were published on September 11th. (Link added to the News page). I mentioned Jane Hart’s Top 100 Tools for Learning last week, this is the last chance to vote for the 2013 list as Jane will publish the latest list on September 30th. Jane Hart’s definition of a learning tool: “A learning tool is a tool for your own personal or professional learning or one you use for teaching, training or e-learning.” Voting closes at midnight GMT on Friday 27 September 2013. For your amusement (thank you to my daughter Sophie for the link), can you figure out these movie titles? from Spiked Math.